Buckinghamshire County Council (“BCC”) is responsible for providing essential services such as social care, education, libraries, roads and transport to almost 500,000 people living across 1,500 square kilometres in the county. The council has over 6,000 IT users ranging from staff at County Hall in Aylesbury, to those in remote offices, to mobile users such as social workers. 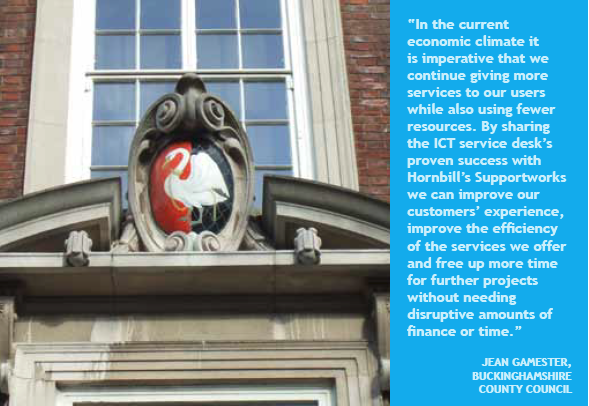 In 2007 the council’s IT service team adopted Hornbill’s Supportworks ITSM Enterprise and its underlying Supportworks platform in order to provide full ITSM functionality such as reporting and change management. It allowed the team to develop capabilities and processes that showed the value of a dedicated service desk tool; and not only for the IT service desk. As a result, BCC shared its Supportworks implementation across Finance and HR, and upgraded the solution in order to consolidate the three teams and provide a standardised, user-friendly and cost-effective way to support the services offered to council staff. Supportworks has acted as the foundation for a programme of continuous improvement to drive down costs and increase customer service. By sharing its Hornbill service management capabilities across the three service teams, BCC has been able to reduce costs, share knowledge and best practice and provide a consistent method of handling customer queries. As a result, the service teams have been able to work more efficiently while the councils’ staff see their issues dealt with more quickly. Rather than taking on separate projects to install new Finance and HR service desks, expanding the Supportworks implementation has allowed BCC to share the tools, processes and best practice that were built up by the ICT service. This has in turn reduced the cost and disruption associated with developing a new solution: BCC estimates that the project has saved 50% on the cost of a separate implementation of Finance and HR service desks. Based on the experience of the ICT service, Supportworks has been used to automate completing certain Finance and HR customer request forms. These include merchant ID and school vendor request forms as well as P60 and training course requests. Since end users no longer have to contact the service team to request and complete these forms, the team can concentrate on more proactive work that delivers greater value to the business. BCC has also implemented Supportworks’ self-service portal across IT, HR and Finance to create a one stop shop for them to raise requests, often via pre-defined forms. Currently 32% of ICT customer requests come in via the portal, which speeds up the process, improves accuracy and provides the service team with advance information while ensuring end users are put in touch with the correct people to help. Using the wealth of data related to the content and delivery of customer requests BCC has produced dashboards to track key KPIs and focus on driving target achievement. By identifying top calls and finding ways of automating, improving process and educating, they have been able to drive down call volumes in ICT by 16%. By using alerts and reports to identify calls that have exceeded SLA, as well as focussed management attention, escalated requests have fallen by 45%. BCC’s shared ICT, HR and Finance service desks has to date been adopted across the council. Using Supportworks’ reporting tools, BCC can track the issues reported and how they were resolved. It then uses this information to report on its progress and improve services. This creates a virtuous circle – as customes use the service desk more information is gathered, user experience and customer service are improved and so the service desk becomes more attractive to users. BCC predicts that when adoption of the shared service desk is complete and service desk staff skills and capability are increased, the specialist teams will only need to spend 50% of their time dealing with direct service calls, allowing more time for improving services and implementing other projects. For example: the ICT service is planning to implement a cloud computing strategy in order to make the organisation’s IT resources more flexible and accessible.